This entry was posted on Monday, August 30th, 2010 at 2:47 pm and is filed under Bureau of Reclamation, Department of the Interior. You can follow any responses to this entry through the RSS 2.0 feed. You can leave a response, or trackback from your own site. It is great to find out and understand our history, it is always not easy to walk through what our ancestor’s path. We should appreciate more rather than complain. Considering our current economic woes, I wonder what an Obama Bureau of Reclamation project would look like. What projects would they take on, and what kind of improvements and technology would be implemented. Thank you for the thought provoking book! I try to dip my toe into American history every now and then being a yank living in England. I can’t see a similar scheme getting off the ground nowadays, it is somewhat a testament to the culture back then that pride was taken in building these still standing structures. While the boys and young men were working at these Civilian Conservation Corps camps I’m wondering if they were getting any kind of pay other than room and board. Do you mean the link to the text of the book? Thanks and that’s interesting. Pls. visit Byrd Vistor’s Center at the park to see the exhibit as it is fantastic. Here’s my picture of the sculpture at Shenandoah Nat’l Park. While I may not necessarily agree with the politics of the CCC I did love the read. It’s important to know our history. The area is west of the Mississippi River in this publication. Do you have one for the East? There is a wonderful display on the CCC with artifacts in the Shenandoah Natl Park. The building is next to the Big Meadows Lodge. Outside is a sculpture of one of the CCC men. Susan: Thanks for your question. 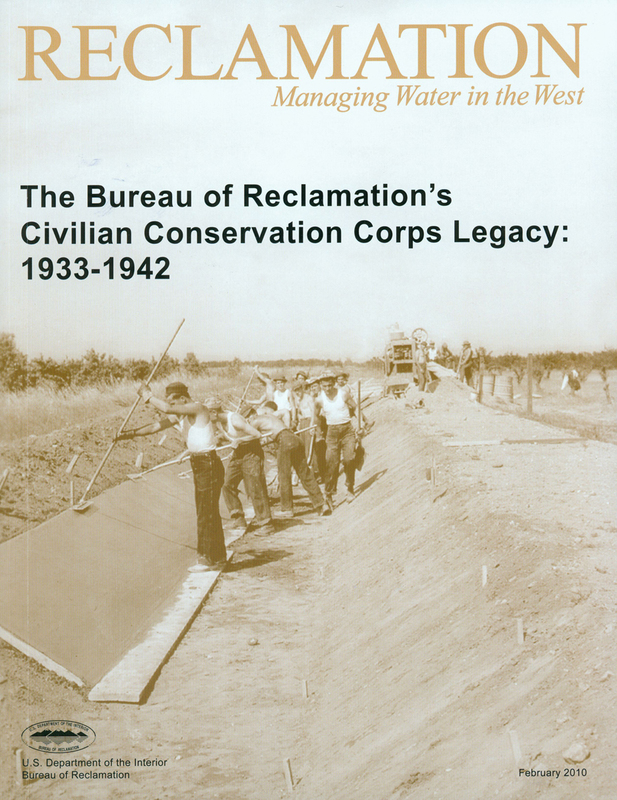 This book includes only the CCC camps run by the Department of the Interior’s Bureau of Reclamation, and they were all out West. Most CCC camps were administered by the Forest Service and the Bureau of Soil Conservation under the Department of Agriculture, and the National Park Service under the Department of the Interior. Your inquiry made me curious, so I checked and, according to the Shenandoah National Perk Web site, “Between May 11, 1933 and March 31, 1942, ten CCC camps were established within, or on leased land adjacent to, Shenandoah. At any one time, more than 1,000 boys and young men lived in camps supervised by the Army and worked on projects directed by the [National Park]Service and the Bureau of Public Roads.” That’s what I love about doing this blog — you never know what’s going to turn up!